Practical insights into how to establish and nurture a modern Enterprise Architecture Management. The digital transformation provides chances and challenges for companies of every size. Successful companies realize that it is far more than an IT topic. More than ever, it becomes indispensable to create transparency on the relation between business and IT. 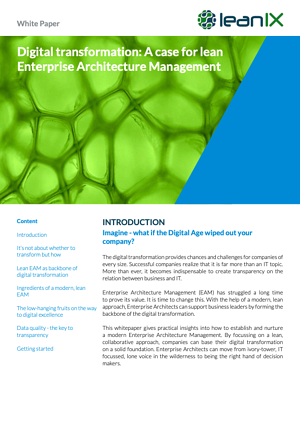 Enterprise Architecture Management (EAM) has struggled a long time to prove its value. It is time to change this. With the help of a modern, lean approach, Enterprise Architects can support business leaders by forming the backbone of the digital transformation. This whitepaper gives practical insights into how to establish and nurture a modern Enterprise Architecture Management. By focussing on a lean, collaborative approach, companies can base their digital transformation on a solid foundation. Enterprise Architects can move from ivory-tower, IT focussed, lone voice in the wilderness to being the right hand of decision makers.